The gathering was much more than a conference, says Betty Anne Kenney: “It was a reunion of friends and an opportunity to meet new friends, a time to be with like-minded people who have all elected to be on the same journey.” Kenney, an associate of Daylesford Abbey, was at the National Gathering of Norbertine Associates hosted at St. Norbert in July. These “like-minded people” share a spiritual road-map. 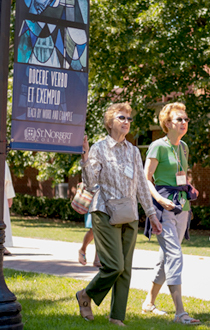 To become a Norbertine associate, a candidate must go through rigorous preparation that includes spiritual formation, communal discernment, study and sustained ministry. An associate, once approved, then takes vows committing him or herself to living according to Norbertine values as a part of their abbey’s community. To Nancy Jakups, an associate of St. Norbert Abbey and organizer of the conference, those vows affirmed her desire to commit herself to a life of prayer and service in community. “Gathering in person centers around sharing,” she says. 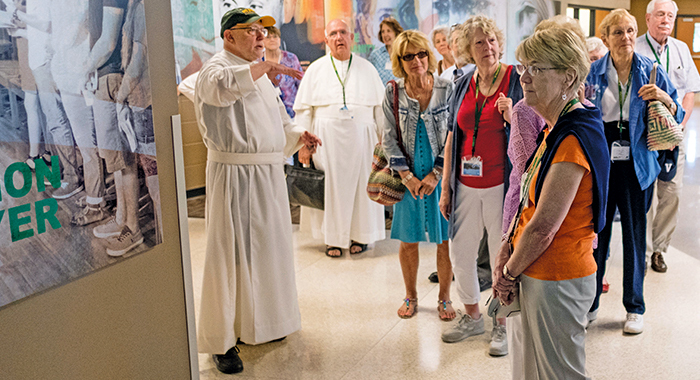 The gathering at St. Norbert College made space for associates from the four Norbertine abbeys in the United States to share stories of how their mutual tradition influences their daily lives. Associates – a “third-order” vocation – came from St. Norbert Abbey in De Pere; Daylesford Abbey in Paoli, Pa.; St. Michaels Abbey in Orange County, Calif.; and Santa Maria de la Vid Abbey in Albuquerque, N.M. The Kenneys began exploring the vocation of associate after taking a Norbertine heritage pilgrimage in Europe with the Rev. Andrew Ciferni ’64. The Kenneys realized their connection with the Norbertines was more profound than just participation in weekly liturgy at Daylesford Abbey. They began to pursue a closer affiliation. At the time, however, the abbey had no formal opportunities for lay persons to take vows. Ciferni introduced them to the idea of an associate program and they worked with Daylesford to begin one there. The conference at St. Norbert was an opportunity for the associates, for a few days, to share their mutual observances of communio, contemplation and prayer. Ken Griesemer, an associate from Santa Maria de la Vid Abbey, says: “The subject of this meeting – how to respond as a person of faith to the call to care for our common home – was very timely. I came away from the gathering with a deep sense of hope in, and renewed commitment to, the collective efforts of many people of faith to make the planet a better place for all of us to live – especially those on the margins, those living in poverty and without hope. A Norbertine associate is a lay person, single or married, who makes a vowed commitment to live life in the manner of the Norbertines. (“Third-order” associates like theirs are sometimes known as oblates.) One who desires to become an associate must enter a formation process that often takes several years before solemn promise is taken. The formation process includes discernment with the abbey community; study of St. Norbert, the Rule of St. Augustine, communio, hospitality, and more; ministry at the abbey and in the abbey’s community; and commitment to spiritual development including regular attendance at the abbey’s Liturgy of the Hours, Mass, and other ceremonial liturgical events. Associates do not live at an abbey nor are they necessarily working full time within the community’s particular ministries; yet they are fully members of the community in which they take vows.